The Adelaide Hills region is an easy drive from Adelaide and gateway entry points such as Stirling, Summertown and Norton Summit can be reached in less than half an hour by car. If driving from the city the Adelaide Hills can be accessed via the six-lane South Eastern Freeway, which links Adelaide to Melbourne. Exits to major destinations, such as Mount Lofty (Crafers), Stirling, Bridgewater, Hahndorf, Birdwood, Lobethal and Mount Barker are well signposted along the freeway. There is a daily bus service that travels at regular intervals from the Adelaide CBD to major townships in the Adelaide Hills. For more information call Adelaide Metro on 1300 311 1087 or visit the Adelaide Metro website. Due to the region's close proximity to Adelaide, taxis are another viable transport option if you don't want to drive or use public transport. Catching a taxi from the Adelaide CBD to Stirling - the nearest major town in the Adelaide Hills - will cost approximately A$50 one way and travelling from the city to Hahndorf will cost approximately A$70 one way. With closely spaced townships and quiet roads, the Adelaide Hills is an ideal place to explore by car. If you don't have your own vehicle, hire cars are widely available in the city and metropolitan areas as well as at Adelaide Airport. 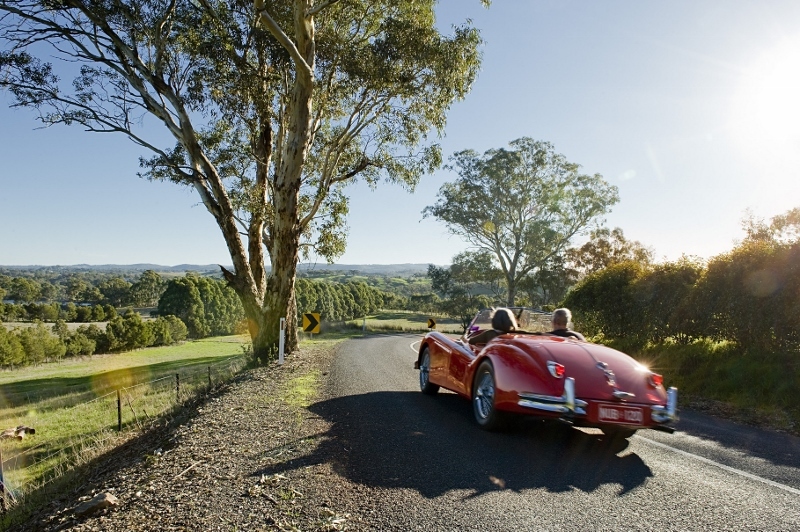 To really take advantage of the beautiful driving experience the region offers, consider upgrading to a classic sports car from a good range available from Adelaide Hills Touring at Basket Range. Once off the freeway, take a back road and see where it takes you - getting off the beaten track is part of the fun. Just remember that drink driving laws are strictly enforced, with a blood alcohol limit of 0.5 on a full licence so if are touring the wineries you'll need a designated driver - or take one of the fantastic private and small group tours available. If you are an international visitor, check out this important information, including keeping to the left hand side of the road! For touring ideas, see our Driving Journeys section. While city-based taxis are happy to bring you up the hill, there is a local taxi service operating in the Adelaide Hills area. To book, call Mount Barker Taxis on 8391 1888. If requiring a taxi during the evening, you're encouraged to book ahead. Exploring the region by foot, on horseback or on two wheels (not the motorised variety!) is very peaceful and allows you to engage more fully with nature and the landscape. Refer to the cycling, walking and horse riding sections for more information. SteamRanger Heritage Railway offers a novel way of seeing the Adelaide Hills and surrounding regions, with various trips departing from Mount Barker. A wide variety of excellent coach and private tours are available.